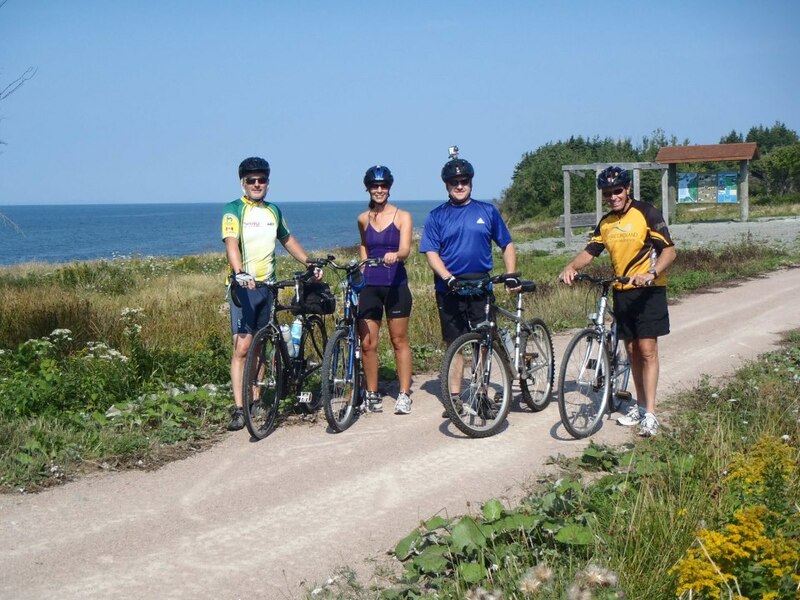 The Celtic Shores Coastal Trail is a 92-km (57 mi) multi-use trail stretching from Port Hastings to the Town of Inverness on the west coast of the spectacular Cape Breton Island. Great for off-road cycling or long distance trekking, the easy, flat trail meanders along the coastline, through picturesque wilderness, skirts streams, and connects several communities and attractions. Along the way you will find active fishing harbours, warm-water beaches in Port Hood, West Mabou, and Inverness, the Celtic Music Interpretive Centre in Judique and five other museums, Glenora Distillery, the Cabot Links Golf Course, and the not-to-be-missed Red Shoe Pub in Mabou. All of this is complimented with a variety of accommodations, restaurants, places to shop, some of the best live Celtic music on the island and a unique living Gaelic culture. Along the trail you find community kiosks and interpretive panels that will provide you with a glimpse of local history and culture. This trail is part of the Trans Canada Trail and the International Appalachian Trail. Trailheads: There are over thirty trailheads and access points along the trail. For location and GPS coordinates click on the Maps & Info button above. Surface: unpaved but smooth and hard-packed for most of the trail. (Upgrading yearly). PLEASE NOTE: Sections of the trail between the Canal (after the 2km mark) and before Troy Station, continues to be sea-swept and trail conditions have resulted in difficult hiking and hike a bike surface conditions. Signs have been posted at the Canso Canal section of the trail. The trail grade is almost flat with very few slight inclines as prevalent in rail trail. Hybrid or mountain bikes are best suited for this trail. Other uses include hiking, snowmobiling, cross country skiing, atving, equestrian & geocaching. The trail begins just as you cross the Canso Causeway entering Cape Breton taking you along the first 20 kms through the communities of Port Hastings, Troy, Creignish, Craigmore and Long Point. Cyclists and low impact hikers please note: For best cycling and walking trail surface conditions it is recommended that you access the trail from Route 19 at the Troy Station, 5.6 km from the round-about/rotary. The first 2km of trail starting at the Canal offer spectacular scenery and a modest trail surface for hiking and sight seeing but recommend cyclists or low impact hikers exit the trail at that point. The next 5 km (between the Canal and Troy Station Trailhead) contain some sea-swept sections of the trail that have resulted in medium to difficult hiking and “hike a bike” trail surface conditions. Stop by the provincial visitor information centre in Port Hastings (seasonally: May to October), pack a picnic for the Troy Station trailhead or Christy’s Look-Off, both provide a rest stop and a grand view of St. George’s Bay. Be sure to watch for pilot whales, bald eagles and a vast array of coastal birds as you enjoy the fantastic coastal view along the route. The next 20 kms from Long Point to Little Judique Harbour will take you past three active fishing communities. In Judique, stop in to the Celtic Music Interpretive Centre for lunch, live music, and to try your skill at step dancing. The quiet Tartan Gardens and gazebo provide a rest and reflection area. The next section of trail takes you to Port Hood, a perfect stop over for a treat at Seaside’s Ice Cream Barn or Bikinis & Trunks Ice Cream Bar and dip in the warm waters of the Port Hood beach. Washroom facilities can be found at the Port Hood Day Park/Boardwalk. After Port Hood, the trail then heads inland, canopies of hardwood trees, riverside scenery and wildlife will stir your senses. The next community on the trails is the Village of Mabou, home of the Red Shoe Pub where foot stomping Celtic music is always on tap. The rolling hills of the highlands, Mabou waterfront and scenes along the waterway are a photographer’s delight. Not far from Mabou is Glenora Inn and Distillery where you can sample the signature Glen Breton Rare Single Malt Whisky. The final section of trail brings you in to the town of Inverness where you will find another wonderful sandy beach, the new Cabot Links Golf Course, live harness racing, the Miners Museum, and the Inverness County Centre for the Arts. The trail is alive with Celtic experiences in villages along the trail in festivals, concerts, square dances and Ceilidh’s, a Gaelic term for a party or gathering. Plan a trip on the Celtic Shores Coastal Trail and experience the ride of your life!